This article is a short summary of Mario Tennis Aces. Mario Tennis Aces is a tennis video game and the eighth installment in the Mario Tennis series that was released for Nintendo Switch in 2018. The tennis is similar to previous Mario Tennis games, notably Mario Tennis Open and Mario Tennis: Ultra Smash. 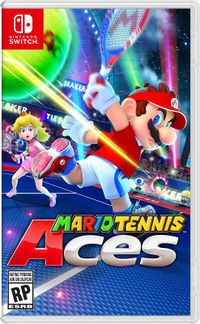 Mario Tennis Aces features a story mode, the first game in the series to do so since Mario Tennis: Power Tour, in which the player must complete various challenges on an island. The Mario Tennis Aces Pre-Launch Online Tournament was originally announced during the Nintendo Direct on March 8, 2018. The software for the demo was released on May 24, and ran from June 1 to June 3, 2018. The demo requires 394 MB of space to download. The demo features four options for play. Online Tournament allows players to compete against others online in standard rules; players will be awarded points based on their performance in matches, and full rankings will be posted on the official website after the tournament is over. Players can also practice against computer players. Also available is the option to review the tutorial, and adjust various settings. Finally, the player can go to the full game's Nintendo eShop page to preorder and check out more information. Players can play as Mario, Peach, Yoshi, and Bowser by default, and can unlock the ability to play as Waluigi, Rosalina, Spike, Chain Chomp, and Toad by earning points. Participants in the online tournament will be given Mario's traditional outfit as a costume in the full game. The Mario Tennis™ Aces game launches on June 22nd, but we're offering an early chance to polish your skills in the Pre-launch Online Tournament demo event featuring online tournament mode. Jump online and fight your way to the top of the in-game bracket in frenetic tennis matches. The more rivals you beat, the more points you will earn, which will unlock more playable characters in the demo. This event will only be active for the short time period between 6/1 and 6/3. By participating and keeping your save data, you can unlock Mario's classic outfit in the full version of the game, once purchased, so don't miss out! To join, download the free demo from the Nintendo eShop, and then launch the demo anytime during this time period. ↑ 1.0 1.1 1.2 Nintendo Direct 3.8.2018. Nintendo (YouTube; March 8, 2018). Retrieved March 8, 2018. ↑ マリオテニス エース [Nintendo Direct 2018.3.9]. Nintendo 公式チャンネル (YouTube; March 8, 2018). Retrieved March 8, 2018. ↑ "Up to 4 players can battle in online matches in #MarioTennis Aces, launching on #NintendoSwitch June 22! Online tournaments will be held often, with bonuses like special outfits & extra characters for those who take part. Pre-launch Online Tournament coming, too! #NintendoDirect" Nintendo AU NZ on Twitter (March 8, 2018. Retrieved March 8, 2018. This page was last edited on 13 October 2018, at 18:47.